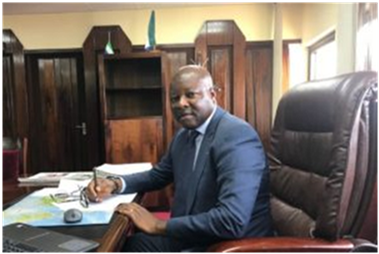 He registered SLCB’s commitment towards expanding its markets and services to various parts of our nation, as well as ensuring that SLCB maintains its posture as one of the leaders in the financial industry in Sierra Leone. Acknowledging that much work remains to be done towards increasing financial inclusion in the country, he reported that in that direction, in 2013, SLCB had on its books a total of 137,945 registered active account holders. In 2014, IT added another 7,207 registered account holders to the mix bringing the total to 145,152 which is roughly 5.22% growth. In 2015, 7,013 new accounts were registered, bringing the total to 152,165 about 4.8% growth. In 2016, SLCB saw significant growth due to bold initiatives that management took to embrace Financial Technologies or FINTECH strategies to further boost our growth levels. An increase of 13,427 new accounts was realized bringing the total up to 165,592 or about 8.8% almost doubling the growth of the previous year. In 2017, SLCB had another growth of 7,210 or about 4.4% to a total of 172,802. In 2018, it recorded its biggest growth since 2013 of 21.088 or about 12.2% to a total registered number of accounts to 193,810. During the first two months of 2019, SLCB has already seen a growth of about 2.5% or 4,776 registered accounts bringing our total to date to 198,586 accounts. Fidilis Turay maintained that in the quest for higher heights, SLCB do not rest on their laurels. He added that with these products aimed to meet both individual customers’ and their corporate customers’ needs; he firmly believe that the convenience and ease of doing banking that these products will afford their customers are going to be second to none in the industry. MI YONE ONLINE BANKING- A very easy to use and very convenient banking application that runs on any mobile device including laptops and desktop computers to bring the convenience of our banking services wherever you are. MI YONE MOBILE APP – is an application that can be downloaded by any SLCB customers with a smart phone or tablet on to their mobile device, for both the android or apple platforms. The application provides a host of capabilities that customers can then use the convenience of their fingertips to access many of our banking services. Again, they can do all of these from the comfort of their home/office or anywhere in the world 24 hours a day, 7 days a week. WI YONE ONLINE DIRECT – This is for SLCB’s corporate customers. This application allows them to pay their employees, salary advance and other banking functions relevant to any business organization. These products, MD Fidilis Turay noted will expand financial services to the non-formal sectors of the economy through automation and electronic forms of intermediation and hence address the low level of financial inclusion and in the process also raise domestic revenue. Meanwhile, SLCB’s earlier launched MI YONE TELLER (the personal mobile banking agent) and the MI YONE KIOSK (banking in a box) are still available and running very strong to reach even more people. Abdulai Fidelis Turay was born on 29th January 1964. He is married with three children. Fidel, as he is popularly known, holds an MBA in Finance from University of Leicester in the United Kingdom and is an alumni of Leicester Business School. He holds a Bachelor of Science in Economics from Fourah Bay College, and has attended a number of professional development training courses and seminars in the banking industry at institutions in South Africa, Ghana, Nigeria, Morocco, Zambia, Cote D’Ivoire, and in country. At FBC, he started his banking career with Meridien BIAO SL Ltd in 1990 and rose to the position of Assistant Manager – Credit and Marketing/Credit and Recoveries Department. He moved on to rise through the ranks at Union Trust Bank to become Credit Administration & Risk Management, a portfolio he held for several years. He broadened his banking experience at UTB heading banking operations, credit administration, marketing and business development, administration and personnel, internal control, project financing, risk management and corporate banking, besides special duties, leading to being in charge of setting up UTB’s branches in the provinces and greater Freetown. Until his appointment at SLCB, he served as Assistant Director at UTB. When UTB celebrated its 20th Anniversary, he was honoured for his exemplary service and referred to as the bank’s institutional memory. UTB, received his resignation with “sincere mixed feelings” whilst acknowledging how he served the bank “faithfully and diligently” for the longest part of his professional life. “Change is an integral part of professional life; in your case it is both lateral and upward, for which we all have ample reasons to celebrate,” the employer concluded. A former colleague at UTB described Fidel is as “cool as cucumber” who cares for stability.